The One - Lemmings / Elf. Cover Disk Only, Original Atari ST Software. This is for use on Atari ST. This item is Used as in the photograph. Manufacturers part number . 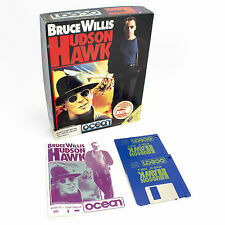 Bruce Willis Hudson Hawk for Atari ST developed by Special FX Software & published by Ocean Software in 1991. • Instruction manual. • Original box. Ending Soon. New Arrivals. Useful Links. WWF Wrestlemania. 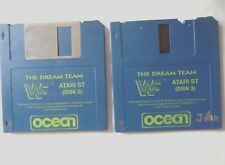 Original Atari ST Software, Dust cover missing from Disk 2. This is for use on Atari ST. This item is Used as in the photograph. Manufacturers part number . Guy Spy And The Crystals Of Armageddon. Original Atari ST Software. This is for use on Atari ST. This is a genuine product. The photograph shows the product you will receive. This item is Used as in the photograph. 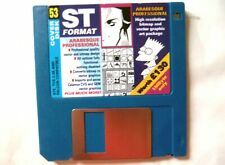 Disk 53 ST Format - Arabesque Professional. Cover Disk Only, Original Atari ST Software. This is for use on Atari ST. Video format : PAL (UK Standard). Manufacturers part number The photo above is of an original item. ANTIC Complete Magazine Collection on Disk (88 Issues) 2 Disc Set Atari Resource. (XL/XE/400/800). YOUR COMMODORE Complete Magazine Collection on Disk (All Issues Specials) 2 DVDs. COMMODORE USER Magazine Complete Collection on Disk ALL 78 ISSUES! Starglider / Overlander / Super Huey. Original Atari ST Software. This is for use on Atari ST. This item is Used as in the photograph. Manufacturers part number . Original Atari ST Software. This is for use on Atari ST. Gemini Wing. This item is Used as in the photograph. Manufacturers part number . Disk 39 ST Format - Dynamo / Magic Story Book. Cover Disk Only, Original Atari ST Software. This is for use on Atari ST. This item is Used as in the photograph. Video format : PAL (UK Standard). RBI Baseball 2. This is for use on Atari ST. This item is Used as in the photograph. Manufacturers part number . Original Atari ST Software. This is for use on Atari ST. This item is Used as in the photograph. Manufacturers part number . 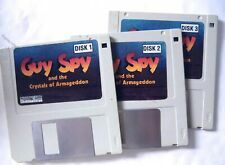 Original Atari ST Software. This is for use on Atari ST. Electronic Pool. This item is Used as in the photograph. Manufacturers part number . Drivin' Force. This is for use on Atari ST. Manufacturers part number This item is Used as in the photograph. Cover Disk Only, Original Atari ST Software. This is for use on Atari ST. Disk 37 ST Format - 3D Picture / International Sports Challenge. This item is Used as in the photograph. Video format : PAL (UK Standard). Disk 19 ST Format - Champion Of The Raj / GFA Basic 2. Cover Disk Only, Original Atari ST Software. This is for use on Atari ST. Video format : PAL (UK Standard). Manufacturers part number . Better Maths. Original Atari ST Software. This is for use on Atari ST. This item is Used as in the photograph. Manufacturers part number . Lombard RAC Rally. This is for use on Atari ST. This item is Used as in the photograph. Manufacturers part number . This is for use on Atari ST. This item is Used as in the photograph. Manufacturers part number . Original Atari ST Software. This is for use on Atari ST. This item is Used as in the photograph. Video format : PAL (UK Standard). Manufacturers part number . Cover Disk Only, Original Atari ST Software. This is for use on Atari ST. Disk 39 ST Format - Pro 12. Video format : PAL (UK Standard). Manufacturers part number The photo displayed shows a genuine item. Atari ST User - Beast Busters. Cover Disk Only, Original Atari ST Software. This is for use on Atari ST. Manufacturers part number : September 1991. This item is Used as in the photograph. Cover Disk Only, Original Atari ST Software. This is for use on Atari ST. Disk 73 ST Format - Twilight / Sea Wolf. Video format : PAL (UK Standard). Manufacturers part number . Cover Disk Only, Original Atari ST Software. This is for use on Atari ST. Disk 34 ST Format - Be Creative / Campaign. Video format : PAL (UK Standard). Manufacturers part number . Disk 46 ST Format - Kubes / Rayoid / Balls. Cover Disk Only, Original Atari ST Software. This is for use on Atari ST. Video format : PAL (UK Standard). Manufacturers part number . Atari ST User - Dogfight. Cover Disk Only, Original Atari ST Software. This is for use on Atari ST. Manufacturers part number : Christmas 1993. This item is Used as in the photograph. Cover Disk Only, Original Atari ST Software. This is for use on Atari ST. ST Format - Write On. Video format : PAL (UK Standard). Manufacturers part number . Cover Disk Only, Original Atari ST Software. This is for use on Atari ST. Manufacturers part number : June 1993. This item is Used as in the photograph. This is for use on Atari ST. Combo Racer. This item is Used as in the photograph. Manufacturers part number . Atary ST User - Air To Air / Superboot / Spider Spell. Cover Disk Only, Original Atari ST Software. This is for use on Atari ST. Manufacturers part number : June 1992. This item is Used as in the photograph. Chess Player 2150. This is for use on Atari ST. This item is Used as in the photograph. Manufacturers part number . Disk 68 ST Format - Magic Storybook / BBS Directory. Cover Disk Only, Original Atari ST Software. This is for use on Atari ST. Video format : PAL (UK Standard). Manufacturers part number . Atari ST User - Violence. Cover Disk Only, Original Atari ST Software. This is for use on Atari ST. Manufacturers part number : May 1994. This item is Used as in the photograph. 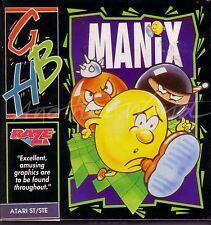 Atari ST User - Harlekin. Cover Disk Only, Original Atari ST Software. This is for use on Atari ST. Manufacturers part number : May 1992. This item is Used as in the photograph. ST Format - GFA Draft Plus 3. Cover Disk Only, Original Atari ST Software. This is for use on Atari ST. Video format : PAL (UK Standard). Manufacturers part number . Eliminator / Nebulus / Pac-Mania. Original Atari ST Software. This is for use on Atari ST. This item is Used as in the photograph. Manufacturers part number . Title : Hard Drivin. Platform: Atari ST. The Ultimate Driving Simulator. Issue 32 Atari ST Review - Family Roots / Neodesk 4. Cover Disk Only, Original Atari ST Software. This is for use on Atari ST. Manual included : No. Manufacturers part number The photo shows the genuine product for sale. Disk 51 ST Format - Fracplay / Zool. Cover Disk Only, Original Atari ST Software. This is for use on Atari ST. Video format : PAL (UK Standard). Manufacturers part number . Cover Disk Only, Original Atari ST Software. This is for use on Atari ST. Manual included : No. Manufacturers part number . STOS Program Disk. Original Atari ST Software. This is for use on Atari ST. Video format : PAL (UK Standard). This item is Used as in the photograph. Manufacturers part number . Title : Microprose Golf. Platform: Atari ST. The definitive Golf simulation.